Sandun Manage Product Manager, Tharanga Weerasinghe Brand Manager, Bob Li CEO, Raveen Kanishka and Maneesha Chanchala at the launch. OPPO, the selfie expert, announced its latest addition to its F-series, OPPO F9. With VOOC Flash Charging that offers two hours of talk with just five minutes of charging and industry first gradient colour design, the F9 has been designed to offer a unique experience and represent OPPO’s technologically advanced and innovative expertise. OPPO F9 will be available for sale at the OPPO Fan’s meet-up scheduled to be held on September 8, at Liberty Plaza. With several breakthroughs such as an industry first 6.3 inch ‘Waterdrop Screen’ design, high screen to body ratio of 90.8%, unique gradient color design and a 3500 mAh battery, the OPPO F9 offers much more in addition to an excellent selfie function – an immersive experience, fast charging and long-lasting battery. At the launch, OPPO also announced a new TVC featuring the Brand Ambassadors Deepika Padukone and Sidharth Malhotra. The TVC titled ‘5 Minute Charge, 2 Hour Talk’ revolves around a day in the life of two characters played by Deepika and Sidharth. It highlights OPPO F9 VOOC Flash Charging capability that enables a user to be connected to their loved ones even with a 5-minute charge on a low battery. 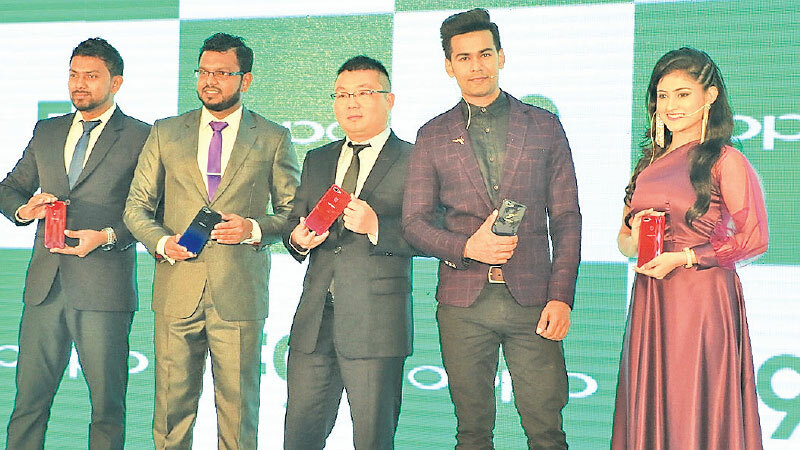 The OPPO F9 Official Sri Lanka launch also saw the participation of two of the Sri Lankan entertainment industry Raveen Kanishka of ‘DeveniInima’ fame Maneesha Chanchala from the popular ‘Sidu’ tere-serial. OPPO found that the most common problem of Sri Lankan users is battery life. These consumers often land in some awkward situations where they are running out of battery. Keeping these in mind, OPPO F9 comes with VOOC Flash Charge. In addition to increasing the charging speed by four times, VOOC also boasts an intelligent five-layer protection system from the adaptor to the port and interior of the phone. VOOC has replaced the voltage reducing circuit with a MCU, making VOOC a cool fast charging tech. You can also use your phone and maintain high speed fast charging, which high voltage fast charge will not be able to support. Since OPPO launched VOOC in 2014, VOOC has applied over 500 patents and is used by over 90 million consumers, making VOOC the most mature commercial fast charging technique.